It feels like he was just a tiny baby and now he is walking, talking, coloring, eating on his own, and acting like more of a little kid than a baby! Welcome to the toddler years. This can be an abrupt transition for some parents as your once sweet baby now has opinions, desires, and agendas that don’t always correspond with yours! Technically, what is a toddler? Typically, a toddler is characterized as a young child who is just starting to walk, the term is often much more applicable to a child’s temperament. In my opinion as a mom and an occupational therapist who works with babies and toddlers all the time, as soon as a baby begins to understand that they have control over their world and can start to act on that, they are a toddler. The walking (running, climbing, hopping) part is just physics. As babies make this transition, it can almost be like getting to know a new person. He is no longer in the same place where you left him, eating the food you put in his mouth, and staying in his crib at night. With his new ideas about how things should work, he now has the physical abilities to act on it. Parents of toddlers really have two jobs, keep them safe and provide experiences for enrichment. Let’s start with safety. If you have not already child-proofed, now is the time. Think about all aspects of safety. 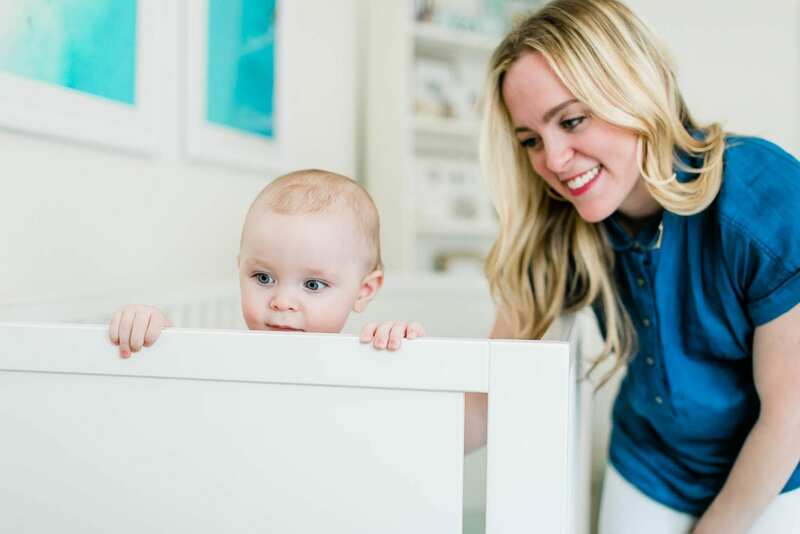 Baby-proof locks on cabinets, safety gates at thresholds, and outlet covers are all critical, but also think about teaching your child safety. Begin the conversations about stranger danger and what to do in dangerous situations. They may not have a firm grasp on language yet, but it is important to start talking about these things very early. They are understanding more than you think. Also start instilling a sense of self-respect. People don’t often think of this as “safety”, but as a mom of teenage girls, I have learned that self-respect can be their strongest suit of armor and this begins early. As far as providing experiences for enrichment, remember, those brain cells are still connecting at a lightning fast rate and the experiences you provide her with now will set the foundation for a lifetime of future learning opportunities. Continue to think about what she sees, hears, tastes, smells and experiences through all of her senses and keep it fresh and new and engaging. Her natural-born sense of curiosity and wonder make her prime for new learning opportunities to engage in every single day. Encourage this through activities and conversations. Give her unconventional toys and see what she can create. Stimulate all of her senses with things such as colored pasta to play with, shaving cream to write on the walls during bath time, and activities to activate those early fine motor skills such as crayons and child-safety scissors. Keep it simple. One step directions, demonstrate what you want from her and remember her grasp on language is still developing. Show him the respect you would like him to show you. Ask him if he is ready to get out of the bathtub before you just reach in and grab him. If he says no, say, “Ok, you have five minutes,” then remind him at two minutes, then tell him what is coming next so he can focus on that instead of focusing on having to get out of the tub. Provide distractions when possible. If she tends to have temper tantrums at the grocery store, print out some pictures of items for her to find while you are there so she is distracted from asking for you to buy her things. Be consistent. Make sure you and your partner have the same rules and expectations of your toddler. Follow through. If you say no more snacks, do not give out any more snacks. It may be hard to stick to this at the time but in time, this follow through will help your child know what to expect and he will respect you because he will have boundaries. Celebrate this new milestone because in the blink of an eye, you will have a preschooler on your hands with all new thoughts, ideas and agendas!